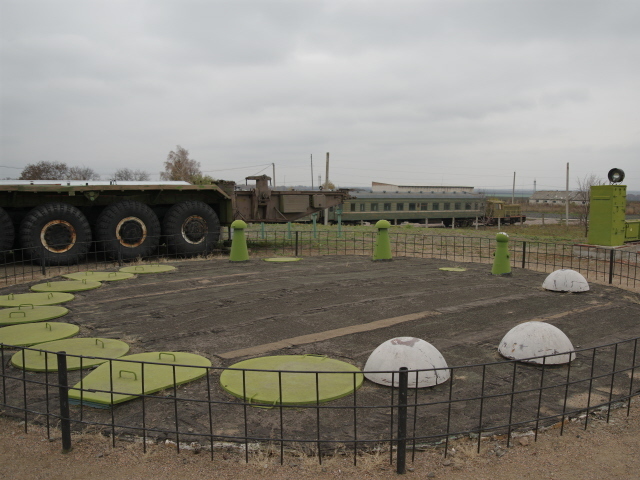 The unique site of a former Cold-War-era ICBM silo and Launch Control Centre (LCC) of the Soviet Union, located in now independent Ukraine, in the countryside between Kiev and Odessa, near the small town of Pervomaisk (not the one in Donbas!). 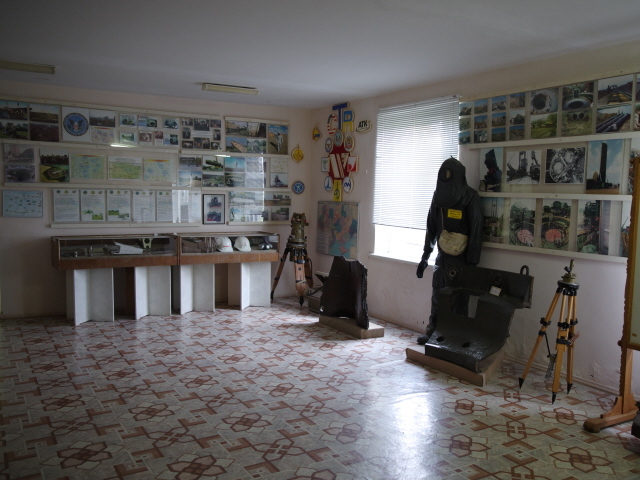 In addition to the original silo and LCC there's a plethora of related objects on open-air display as well as a dedicated small museum. 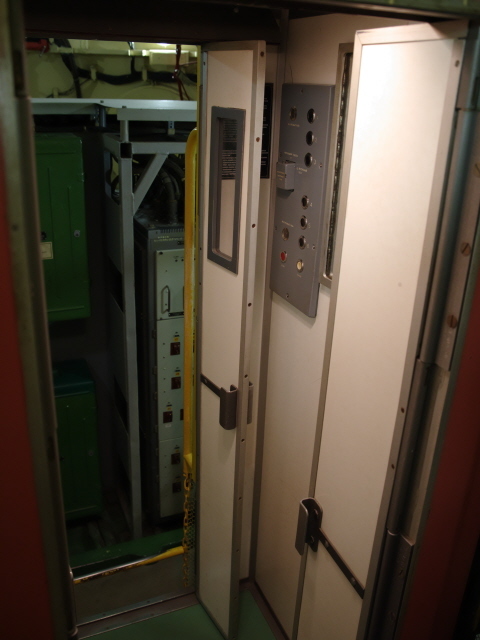 But the highlight remains going down to the original underground LCC for the spectacle of a simulated launch. More background info: There's lots of conflicting information about this site so it is hard to come to an overview based on solid, reliable facts. 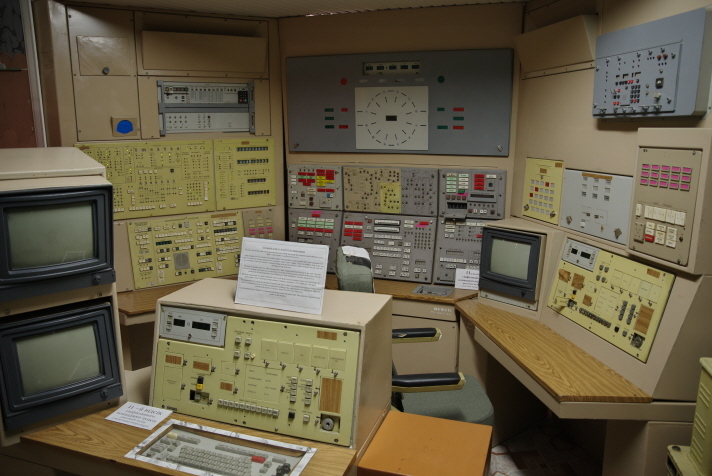 From what I could gather, the silo and Launch Control Centre (LCC) formed part of the 46th division of the 43rd “Rocket Army” … the equivalent US terminology would be 46th Missile Squadron of the 43rd Strategic Missile Wing – cf. 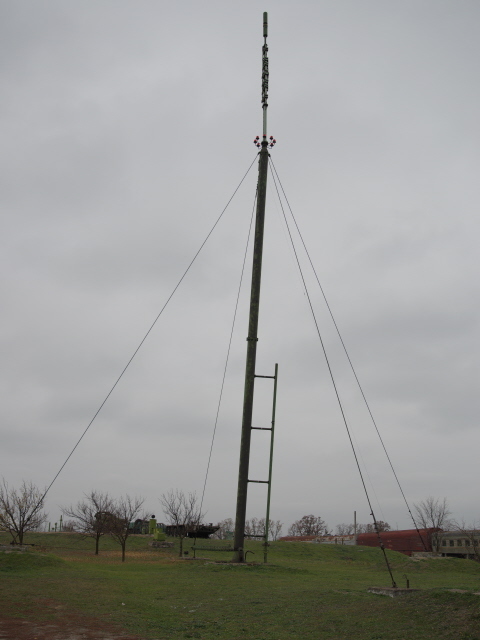 Minuteman missile base. 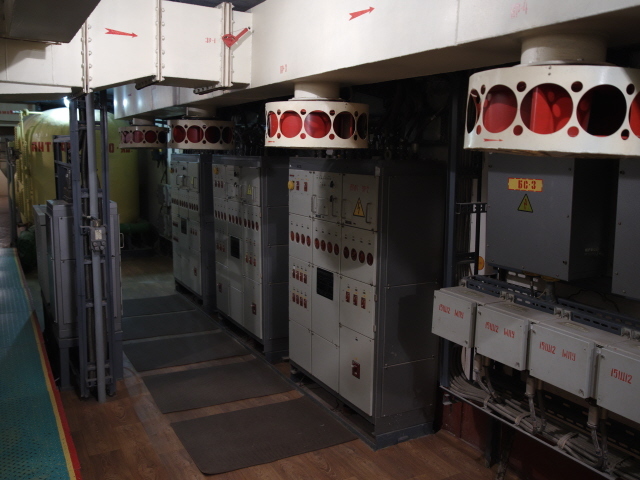 Their physical layout was also similar, in that each LCC was responsible for 10 missiles each, placed in silos in a ring around the LCC some distance away and fired by remote control. 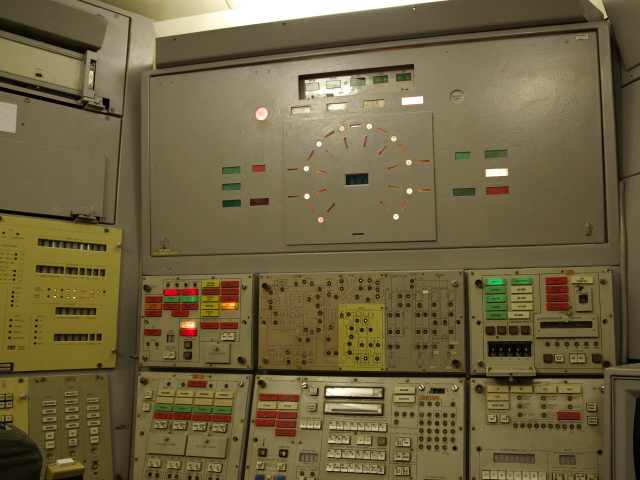 The missile base apparently goes back to an older predecessor from the 1960s, but the silo, LCC and their related top-side facilities we see at the museum site today all date from the time the ICBMs in question were three-stage RS-22s/RT-23s, or SS-24 “Scalpel” missiles in NATO code, which were introduced in the late 1980s. Each was capable of carrying 10 MIRV nuclear warheads ('multiple individually targetable re-entry vehicles'), each with a yield of ca. 550-750 kilotons (sources vary on the exact figure). 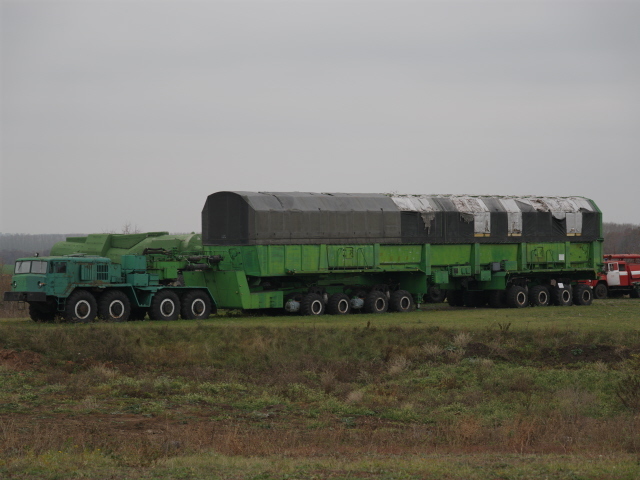 In addition to silo-based launch facilities there were also large numbers of SS-24s on rail-based mobile launchers. Each silo was over 30 metres deep and suspended on huge shock absorbers. 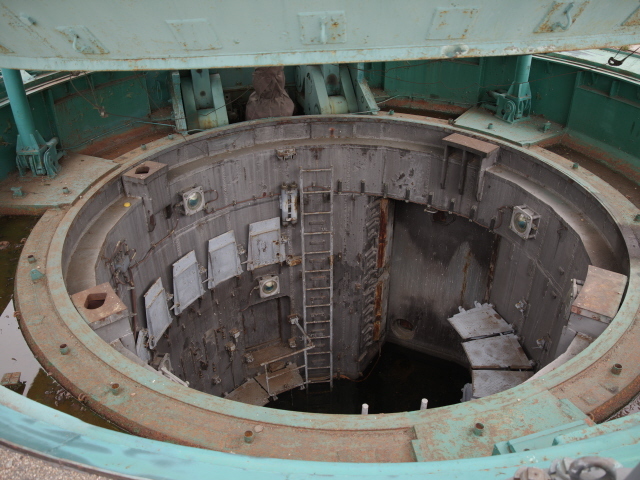 The steel lid atop the silo was not, as in the US equivalents, slid to the side prior to launch, but lifted up hydraulically. Another difference to their American counterparts was that the SS-24s were “cold-launched”, i.e. 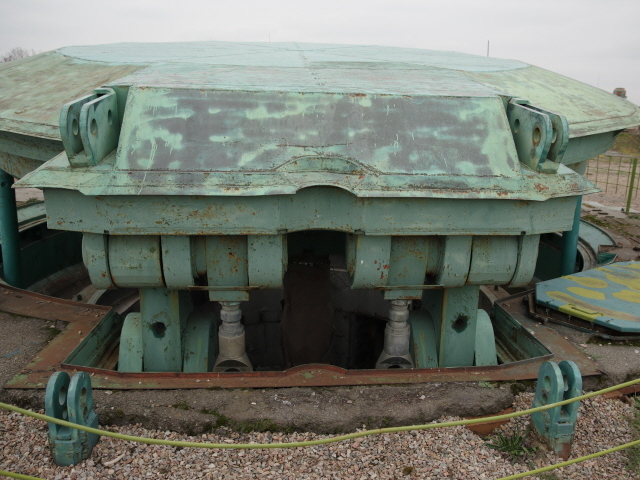 they were first propelled out of the silo (whether by means of compressed gas or by a gun-powder explosion, as my guide insisted, isn't quite clear) and only then did the engines ignite. That's also why there are no exhaust vents next to the silo. Unlike their American equivalents, where there were just two missileers down each LCC, these Soviet models had crews of three – two operators for the launch keys/buttons plus a separate commander sitting adjacent to them (while in the USA one of the two-person crew was the commander at the same time). After the collapse of the USSR, and with START I (strategic arms reduction treaty) coming into effect in 1994, all nuclear ICBMs in now independent Ukraine were removed to Russia to be destroyed. 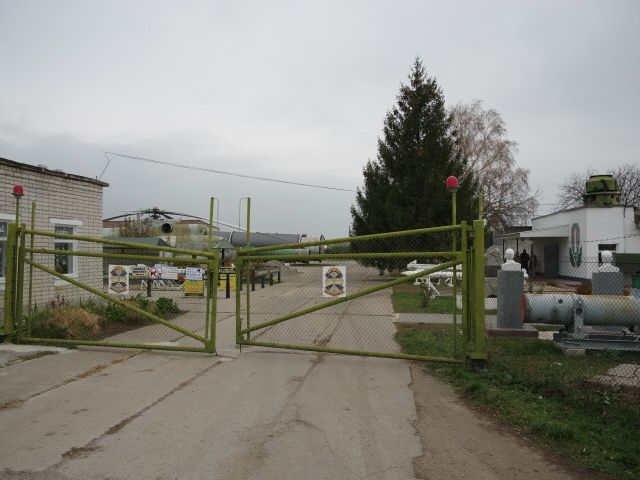 The missile silos and LCCs in Ukraine were decommissioned by 1996 and this particular base was finally disbanded completely in 1997. The infrastructure, in particular the silos, had to be destroyed too according to the treaty, yet one LCC and one – now empty – ICBM silo were kept intact to be turned into a museum (in fact the silo is partly filled with concrete and partly flooded, only the top part is original). This particular site was chosen because here one of the silos was unusually close to its LCC, only ca. 150 metres, whereas they were otherwise often miles apart. 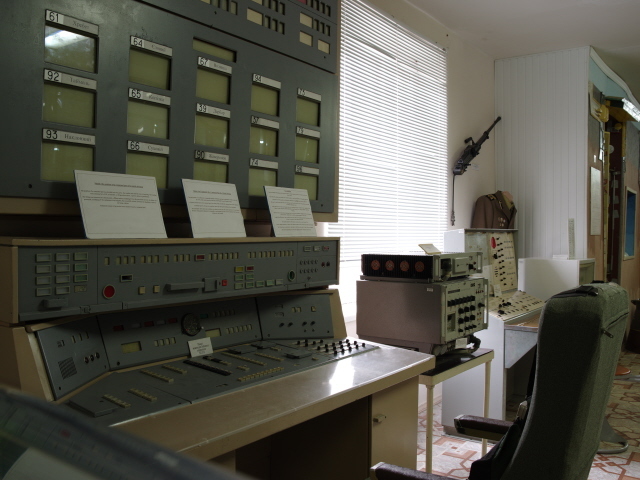 The museum first opened in 2001, run by ex-missileers. 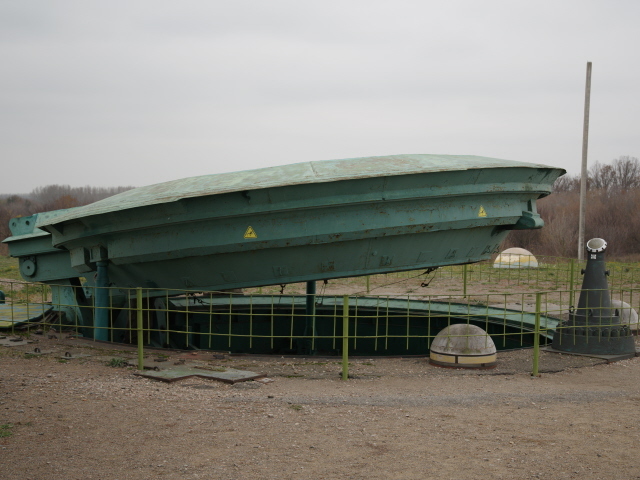 There are still some at the site, but on tours for non-Russian/Ukrainian-speaking foreigners outside guides are used (none of the ex-missileers speak any English). Yet you may still see them, though, looking suitably menacing in their military fatigues, as they accompany tours to the LCC. 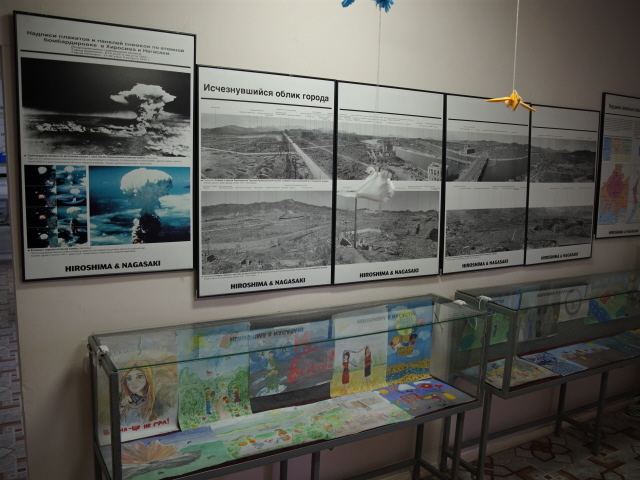 The site is popular with locals, for whom all manner of other attractions and activities seem to be on offer, going by a poster at the site, but most foreigners will come as an add-on to a Chernobyl tour, and with the same companies that do such tours. NOTE: don't get this Pervomaisk confused with the place of the same name near Luhansk in currently war-torn eastern Ukraine. 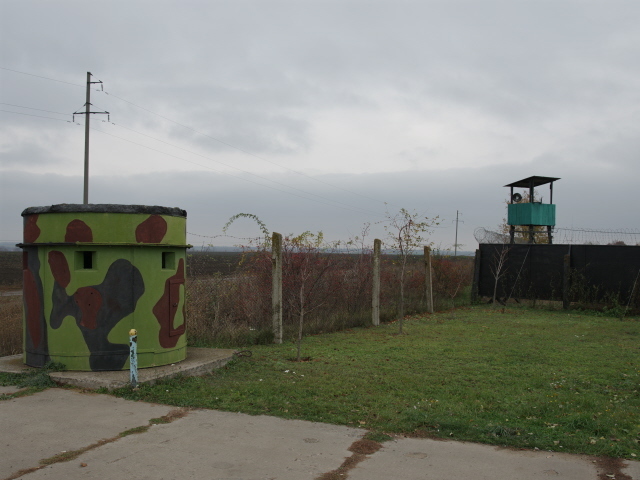 So this Pervomaisk in southern Ukraine is perfectly safe to visit! Note also that in the transliteration from Russian the spelling is “Pervomaysk”, and you can find it spelled like this a lot too. What there is to see: Quite a lot – not just the silo and Launch Control Centre (LCC), but also plenty of other stuff. Ideally you should book a guided tour, especially if you don't speak any Ukrainian/Russian (nobody at the site speaks English) – see below for more details. We were driven to the site by my Chernobyl guide from Kiev but when we got to the gate – flanked by a machine-gun bunker post and a watchtower – we were handed over to a local English-speaking guide (who lives in the nearby town of Pervomaisk) who was introduced to us as Helen (but I'm pretty sure that's the same person who offers English-language tours under the equivalent Slavic name of Elena – see below). We started at the museum – housed in a former ancillary building. 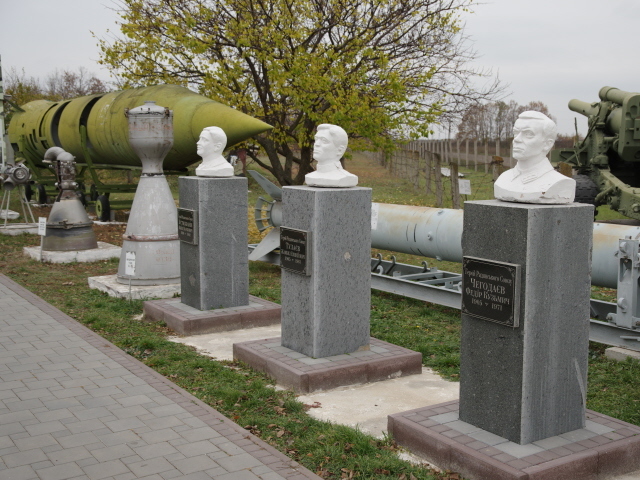 The path leading to the entrance is flanked by a series of busts of apparently important figures in the course of the relevant missile history as well as various rocket engines and an old R-12 intermediate-range missile (cf. Plokstine), which however looks a bit decrepit with the big holes cut into the side and moss gathering at the top. 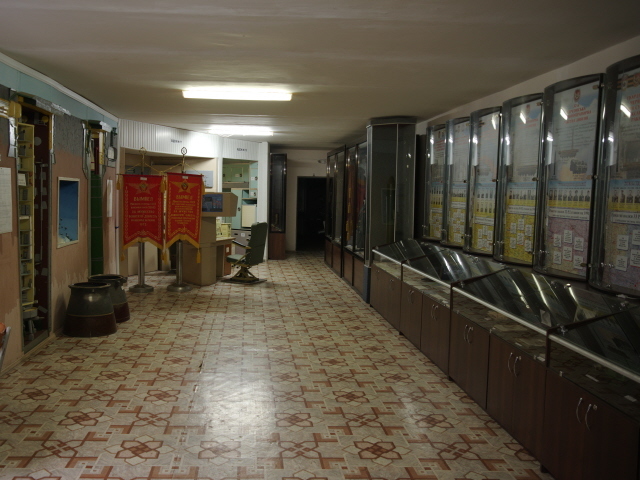 The exhibition inside is very old-school, in that (post-)Soviet/Eastern Bloc kind of way. 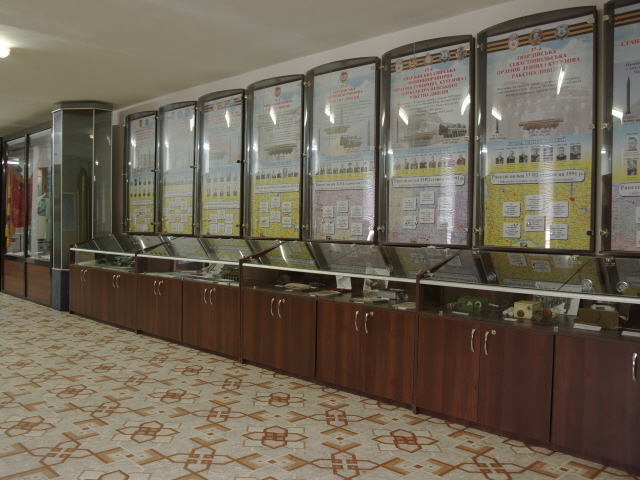 A row of display cabinets apparently listed all manner of military historic details and bits about persons involved, but our tour bypassed those rather stiff-looking elements altogether. 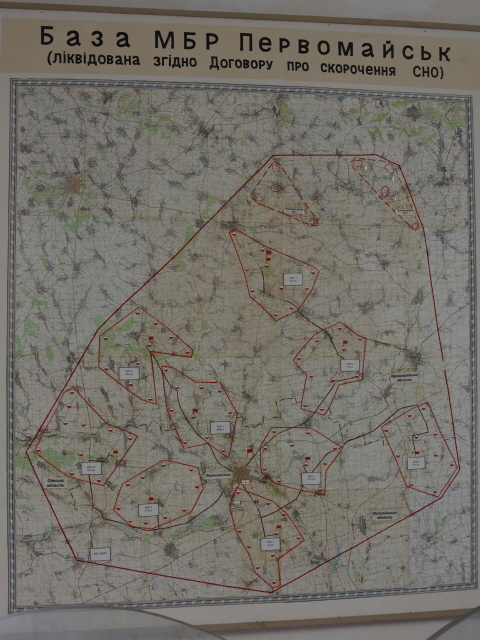 Instead we started at a large poster showing the former distribution of missile fields over the territory of Ukraine, the layout of this particular division, and schematic depictions of the trajectory of a three-stage SS-24 missile and its MIRVs (see above). 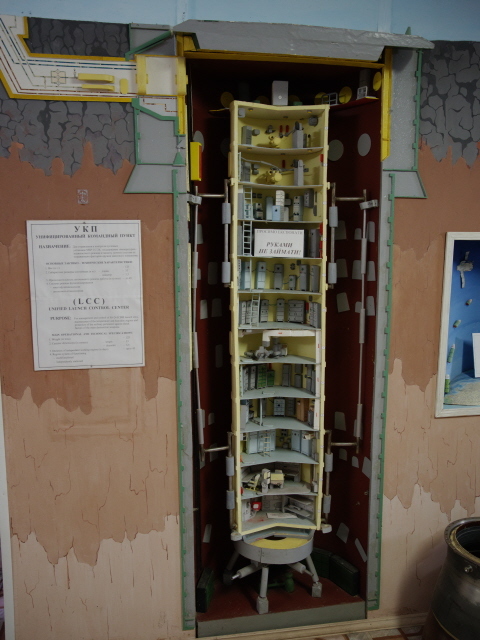 There's a scale model of the top-side layout of this particular facility too. There's a mock-up of the security facilities each such site used to have, including a whole console with tiny little CCTV monitors set into it. 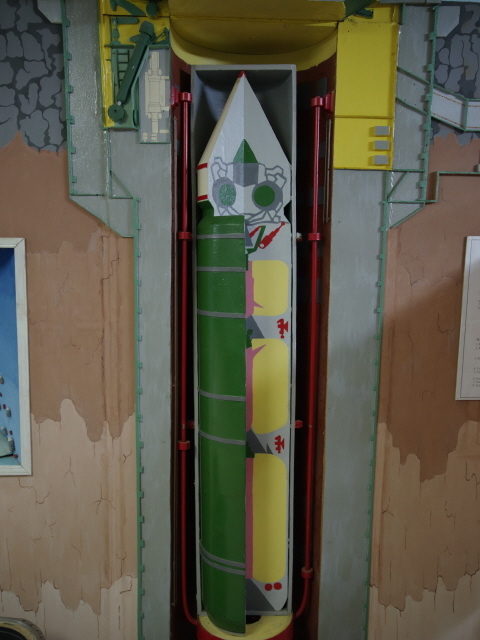 A crude model of a missile in its silo is complemented with a much more detailed model (lovingly made, really) of the LCC cylinder with the command post at the bottom at level 11. 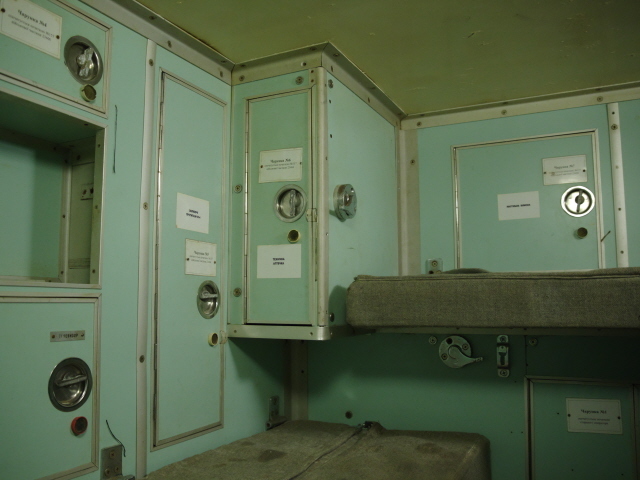 There's even a life-size mock-up of a launch command centre and the crew's sleeping quarters. But this is just to look at, it's not in working order. 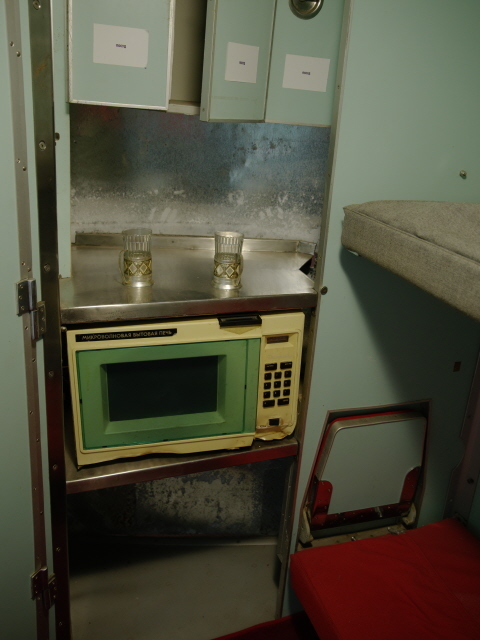 Things that were worth pointing out were the amenities the crews enjoyed – even a microwave oven (when the rest of the USSR's ordinary citizens couldn't even dream of such appliances). 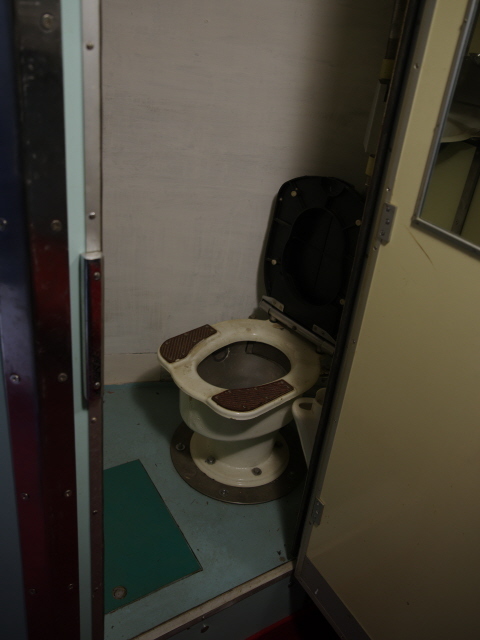 The toilet seemed to be of the combined sit-down-or-squat type I'd seen in India. A glass-door fridge mock-up shows the kinds of produce they'd have in stock at such bases to provide sustenance. 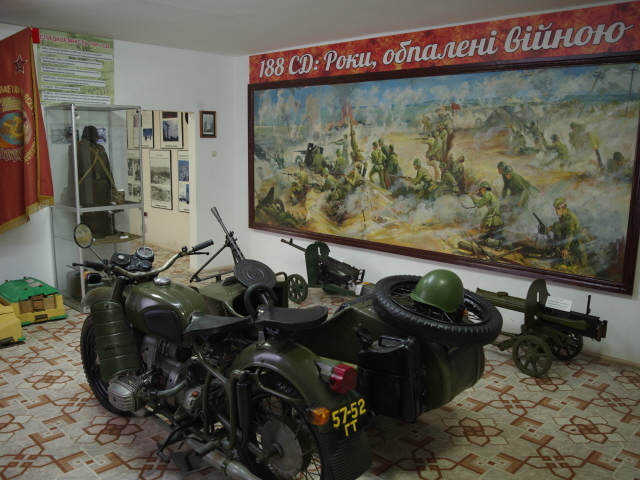 In addition to the exhibition about this missile base in particular, there are also sections about its prehistory, apparently going back all the way to WWII (aka Great Patriotic War in Eastern/Soviet terminology), with a typical socialist-realist battle painting on the wall and a Nazi German Wehrmacht motorbike with a side car armed with a heavy machine gun on display. But we were rather rushed through this section (I didn't mind). 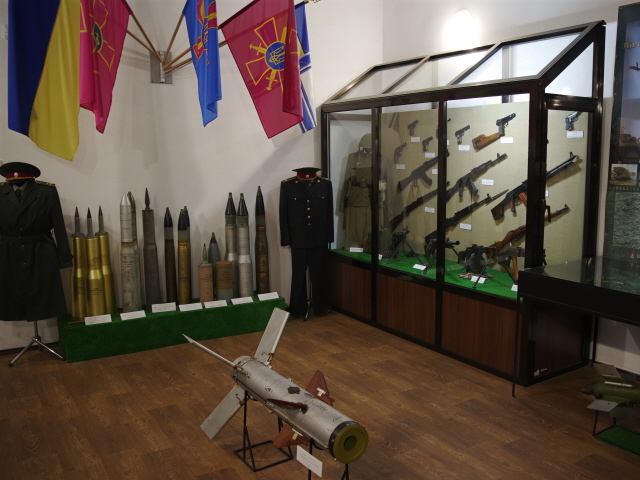 Another room was chock-full of all manner of shells, missile parts and a plethora of machine guns, pistols and rifles as well as different types of landmines, which we (thankfully) also didn't give much time. More interesting was the next room about Hiroshima & Nagasaki, featuring many of the well-known photos of the mushroom clouds and the destruction caused by these two American atomic bombs dropped on Japan in 1945. The story of Sadako Sasaki and her paper cranes (see Hiroshima Peace Memorial Park & Museum) obviously features here too. But the accompanying children's drawings in a long glass display cabinet added a bit too much pathos for my liking. The final section was about the decommissioning of the missile bases in the 1990s, and here I would have liked to have had a bit more time, but instead we were rushed on and back outside. We were then led to a different building inside which is a staircase that took us down to the beginning of the underground connecting tunnel that leads to the top of the LCC. It's some 500 feet (150 metres) long and ends at the top of the lift shaft. This runs parallel to the steel drum the LCC is housed in so you also get a good look down into the abyss when boarding the lift. It's rather flimsy and built for max. 3 people, but we squeezed in and down we went. 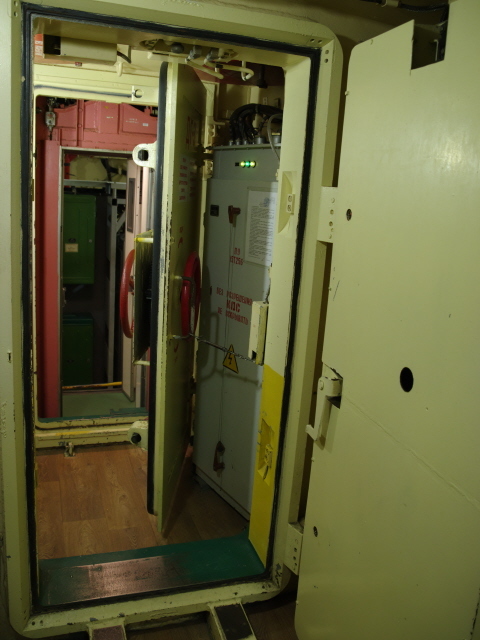 We got to the very bottom and emerged through a steel blast door into the “living quarters” at level 12. 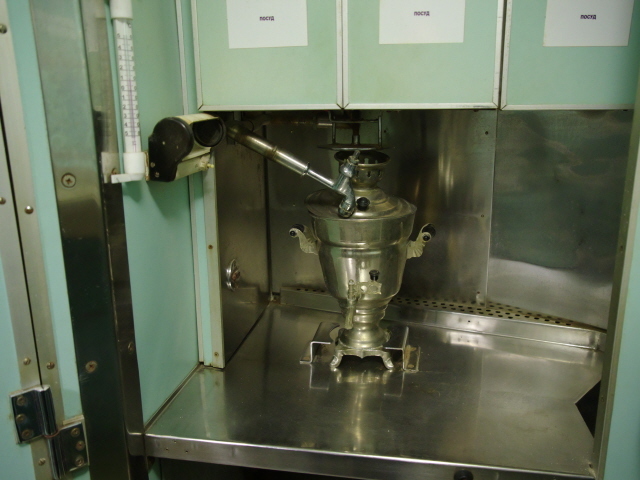 This compartment looks very similar to the mock-up in the museum, but instead of a microwave oven, here they had a silver samovar … how much more Russian could it possibly get! 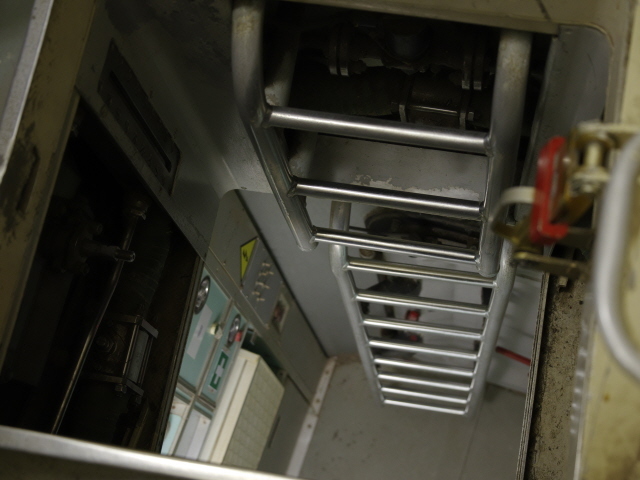 To get to the actual launch command centre we had to climb a vertical steel ladder and go through a hatch – which isn't the widest, so my companion asked the guide if they ever get really big American visitors who have trouble fitting through. Apparently yes – though the guide tried to be a bit cagey about this. Anyway, it is clear that this is not something for people with any mobility issues. Claustrophobia would also be disadvantage. It really is rather cramped and oppressive down here. 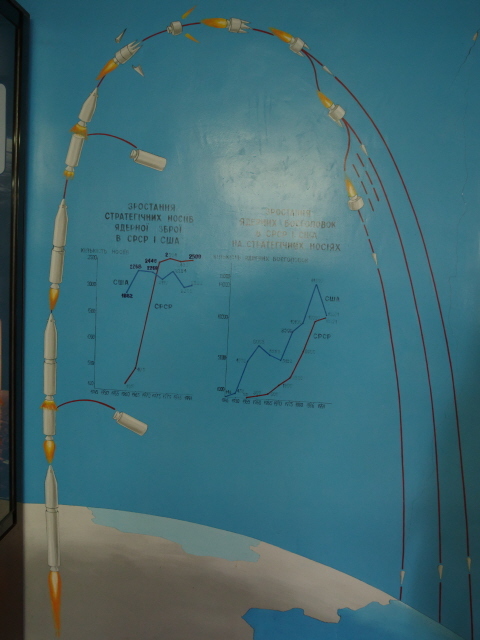 But now we were in what most people will consider the highlight of the whole tour: namely the “simulated launch”. So two visitors are sat in the seats of the two operators at the desks with the launch keys and buttons. 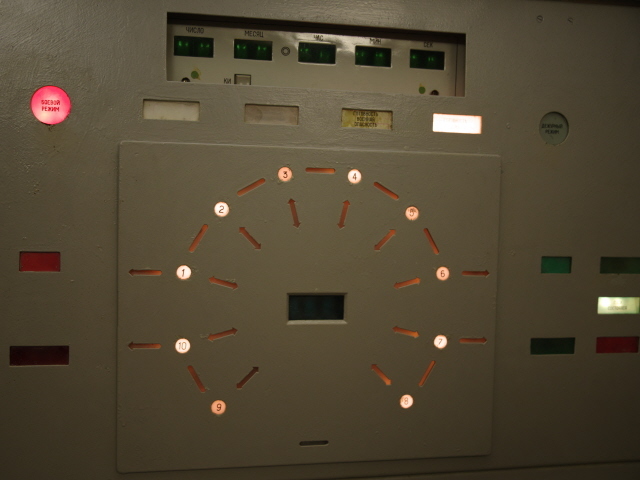 Unlike at the American equivalents (see Minuteman site and/or Titan II), where it is only keys to turn – which are three metres apart, so a single person couldn't turn both at the same time – here the security trick is that both operators each need one hand for the key and the second for the button, so no single person could operate all four alone. We looked around the panels and mysterious-looking equipment for a bit longer and the guide pointed out a banner flag in a corner that was the original back in the day but is now kept in a perspex tube. Apparently some recent Ukrainian visitors complained about the hammer-and-sickle symbol at the top – because a recently introduced law made public displays of such symbols illegal. But this place is exempt as it is classed as a museum. 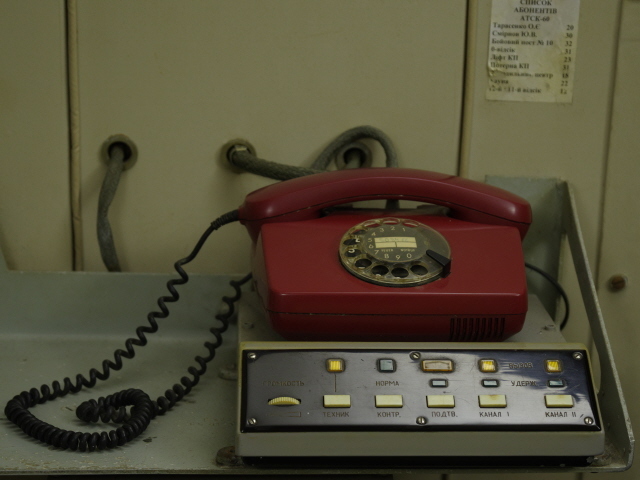 What I found more remarkable was the red telephone that stood in a corner. This was probably intended to look like a genuine hotline phone or so … but on closer inspection I saw that it was actually just an old phone from Germany, with the boxes for numbers labelled “Feuer” ('fire brigade') and “Notruf” ('emergency') still on the dialling disc! 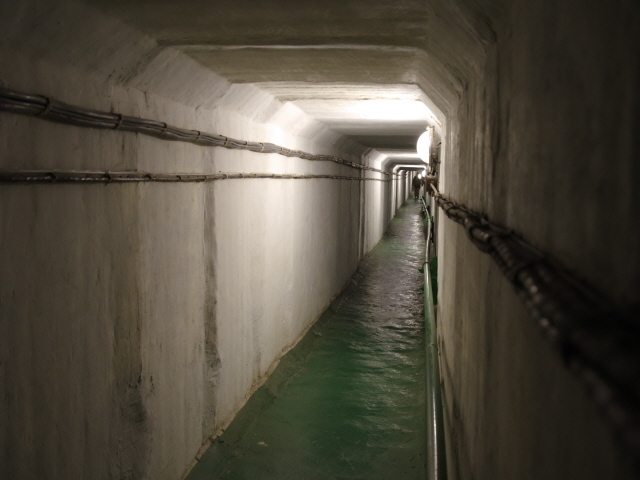 After that we took the lift back up to the top and were given a demonstration of the noisy ventilation system, and then retraced our steps through the connecting tunnel and re-emerged into the fresh air to inspect the open-air parts of the museum complex. We walked past the main communications mast and past the top-side lid of the underground LCC, and on towards the actual missile silo. The heavy steel lid was standing slightly raised so that you could look down into the empty silo … but only for about 5-8 metres. Beyond that the silo appeared flooded with water (and I've meanwhile learned that the bottom two thirds are actually filled in with concrete). Dotted around the area are several vehicles on display. Most importantly this includes the actual missile transporter – a massive 12-axle juggernaut – as well as the machine used for inserting the missile into the silo, tankers, and fire engines, tanks, armoured vehicles and troop transporters. 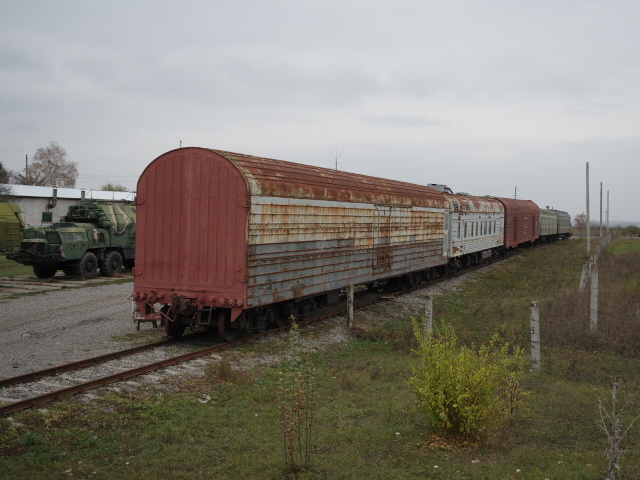 Also on display was one of the missile trains that used to be the other launch platforms for SS-24s (see above). The latter looked in a rather sorry, rusty shape, while some of the other vehicles and the tanks looked like they could still be operational. Going by older photos of the site, I gathered that the number and arrangement of the vehicles on display has changed quite a bit over time. The number of items seems to have increased and their positions altered. So it may well be that further such changes will be made in the future. Finally we headed back towards the gate, and en route we were able to see the large collection of smaller missiles, including 2K12 “Kub” SAMs (surface-to-air missiles), the predecessor type of the current Russian “Buk” system, which infamously is blamed for having been used by pro-Russian separatists in eastern Ukraine to shoot down Malaysia Airlines flight 17 in July 2014 – something that our Ukrainian guide had to mention here, of course. 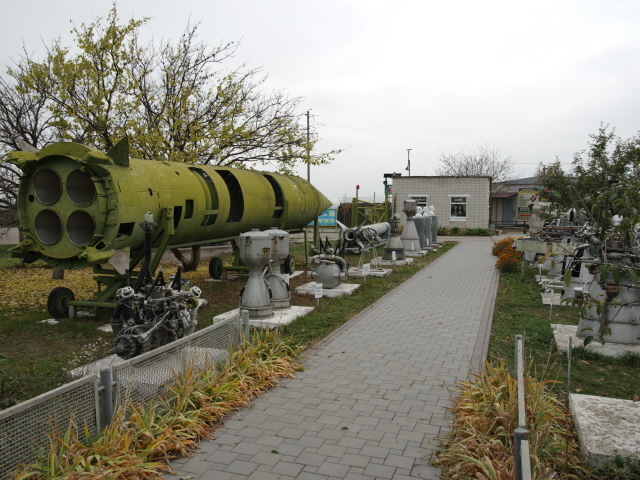 But the star exhibit of the whole collection is the massive black hulk of an SS-18 “Satan” ICBM, the most powerful of the Soviet arsenal (the equivalent of the USA's “Peacekeeper” – cf. USAF Museum – which also carried 10 MIRVs; see above). It's lying on its side with the cold-launch pack attached at the bottom – and it's size, 34 metres in length, over 3 metres in diameter, is surely impressive. Note, though, that contrary to some claims you can find on the Internet, no SS-18s were ever stationed here in Pervomaisk. 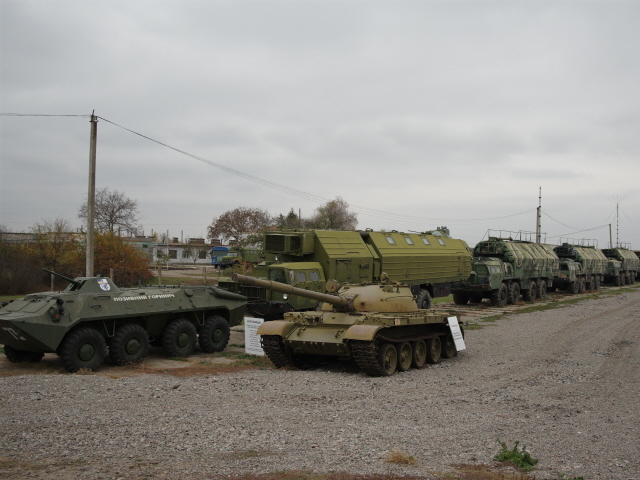 In addition there are a couple more rusty tanks and other vehicles, an old MiL-Mi-8 helicopter and a collection of air-to-air missiles, and that's it. 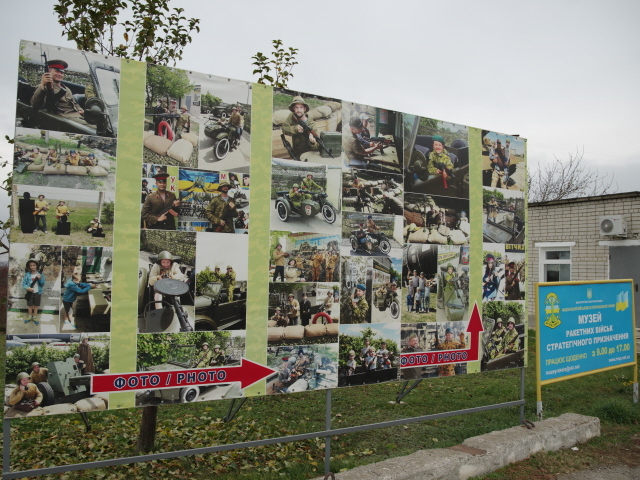 A huge poster by the gate advertised various other activities, like riding military vehicles, dressing up in uniforms, handling machine guns and other such lad stuff. But for us this was the end, we parted from our local guide and reunited with our Chernobyl guide for the long drive back to Kiev. And how does it compare to those American equivalents? Quiet favourably, actually. 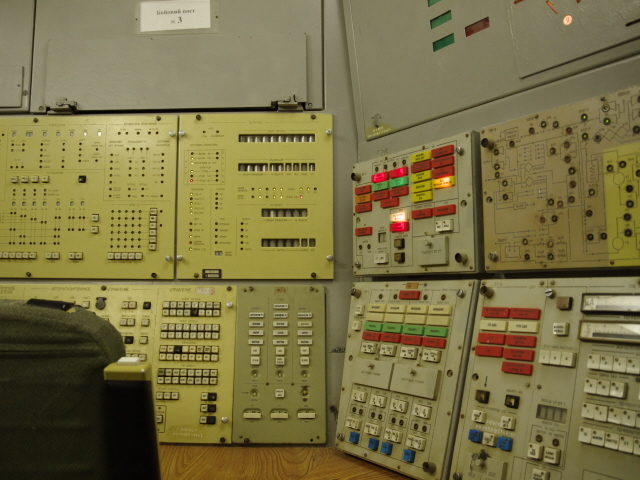 OK, the sites in the USA are somewhat better maintained and at the Minuteman site in South Dakota you get the benefit of being guided by an ex-missileer full of anecdotes (though if you understand Russian/Ukrainian you can get that here as well!). But this Ukrainian site has the bonus, from the perspective of a Westerner, that it's from the “other” side of the former Iron Curtain, the formerly great unknown of the ex-enemy, and hence comes with an extra dose of “mystique”. Location: in the south of Ukraine, some 17 miles (25 km) north of the small town of Pervomaisk, ca. 180 miles (300 km) south of Kiev. From the main Kiev-Odessa highway, turn off for Holovanivsk onto the P06 road and proceed in the direction of Pervomaisk until you come to the signposted (in Cyrillic only) one-mile access road to the left near the village of Pobuz'ke. Access and costs: remote and difficult, but relatively cheap if done independently (with the prerequisite language skills), or by rather expensive guided tours from Kiev. 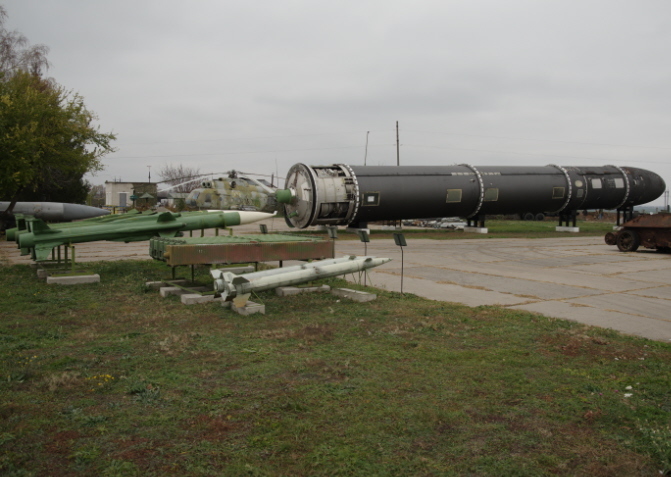 Details: Tours to the Pervomaisk Strategic Missile Force Base are offered by several of the same companies that otherwise specialize in Chernobyl tours – so the two can be ideally combined using the same operator. Both start/finish in Kiev. Costs for the ca. eight-hour tour (six of which are driving time from/to Kiev) vary dramatically according to the number of participants. For a single-person private tour, the cost may be fairly steep, currently 300-380 USD, but it goes down to less than a third of that per person if you get a group of four together. And it drops below the 100 USD mark for even larger groups. You can either form your own group or join one already signed up and open to accept more participants. It's advisable to get planning well in advance. The cost includes transport and English-language guiding as well as local admission costs and surcharges. If your Ukrainian/Russian is good enough (no one at the site itself speaks English) and you are prepared to drive it yourself, you can of course visit independently and save a lot of money. I don't know the exact prices, but was told that there is a tier system, i.e. 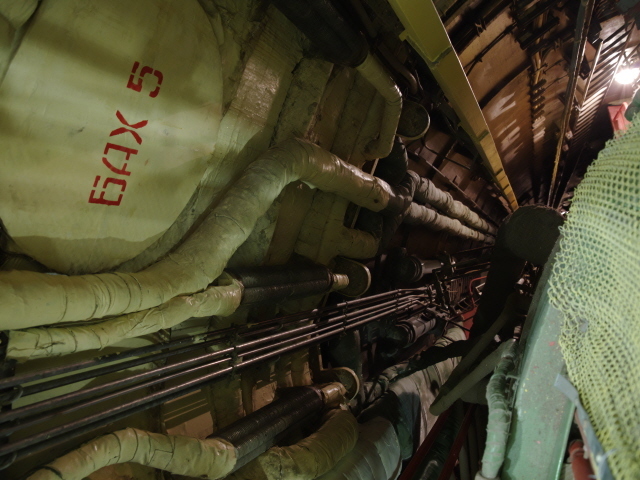 you can opt to visit just the top-side exhibits and the museum, or pay extra for the tour of the underground LCC (and of course you wouldn't want to miss out on that! ), extra charges for a photo permit are levied. In total this will cost in the region of 100 UAH – a pittance (just over 3 EUR), but you still have to get there first. Apparently you can also book the Pervomaisk-based, English-speaking guide I had independently, i.e. bypassing any Kiev-based tour operators. And if you don't have your own means of transport she can help arrange that too. How much you'll save that way, I can't say, though. You'd have to enquire. Her name is Elena Smerichevskaya. Opening times: daily from 9 a.m. to 5 p.m.
Time required: Basically a whole day if done as a day return tour from Kiev. The drive takes ca. three hours each way alone. The tour at the site then takes ca. one-and-a-half to two hours. So that's ca. eight hours in total, plus usually a lunch break en route back. Combinations with other dark destinations: Since most tours for foreigners depart from and return to Kiev, that city is the most obvious combination. And as most companies offering tours to the Pervomaisk missile base primarily do tours to Chernobyl, that is the most common combination. Combinations with non-dark destinations: None, really, unless you are doing it independently in your own vehicle, in which case you could carry on all the way to the fabled coastal city of Odessa, for instance. Otherwise see under Kiev.